If you’re looking at buying a Brother embroidery machine, there are a lot of options and features to consider. You need to know which features are important to you, what you really need, and what options you’re willing to spend the money for. How you download additional designs into the machine. This article will explain how these features differ among 3 of the most popular home Brother embroidery machines. If you’re looking for an embroidery machine, this information will help you get started. If you have a sewing room or space to leave two machines set up, or if you do a lot of embroidery, you probably want a dedicated embroidery machine. Or if you already have a good sewing machine that you like, you don’t need another one. The advantage of a dedicated embroidery machine is that you don’t have to take down the embroidery unit just because you want to hem a pair of pants or some other small sewing task. The disadvantage is that it’s also convenient not to have to switch machines if you want to embellish the sewing project you’re working. Dedicated embroidery machines usually cost more, but are higher-end machines. So you also get more features. If you need the extra capabilities, you may have to get a dedicated machine. 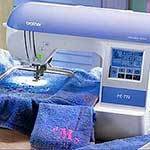 The Brother SE400 and Brother SE350 are combination embroidery and sewing machines. The Brother PE770 is a dedicated embroidery machine. It doesn’t do sewing. Many embroidery designs are available that fit in a 4×4 inch frame. But a lot of designs require 5×7 inches. You can make up larger designs by combining the smaller motifs, but you can only embroider up to the frame size without disconnecting the design and repositioning. Sometimes, you can split a large design with embroidery editing software. Of course the larger field costs more, but is a lot more convenient if you want larger designes. The Brother SE400 and SE350 have 4″ x 4″ embroidery fields. The Brother PE770 has the larger 5″ x 7″ field. 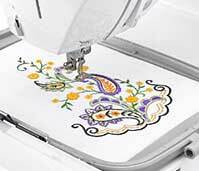 There are three basic ways to download additional embroidery designs into a Brother embroidery machine. The first way is with Brother embroidery cards. You can buy designs already on a Brother embroidery card. The cards can be expensive, but if you want a special design, this might be the only way to get it. You can also download free and low-cost designs from the Internet and write them to a card. You will need additional software and a card writer/reader such as the Brother PED Basic software to write the designs on a card. This is an additional expense, but blank cards are expensive and as one comes with the PED Basic package, you are getting the software and card writer virtually for free. Even if your machine has a USB port to download designs, the embroidery machine cannot write the cards. You need a separate card writer. The Brother SE350 only has a memory card slot. So the only way to download additional designs is with a memory card. The SE350 has been discontinued and replaced with the SE400. So I no longer recommend the SE350 unless you can get a really cheap price. Remember to add in the cost of the software you’ll need. 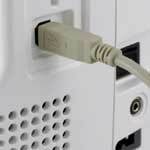 The second level of downloading additional embroidery designs is through a cable USB port. This is the kind of USB port that attaches to your computer with an included USB cable. You just download designs from the Internet into your own computer, attach the embroidery machine, and import them. This type of USB port is not compatible with a USB jump drive. The Brother SE400 has both a Brother embroidery card slot and a USB port and cable that attaches to your computer for downloading. The third (and best, in my opinion) option, but also the most expensive, is a USB port that is compatible with a jump drive or memory stick. This is very convenient because you don’t have to move your computer next to the embroidery machine or even have a computer all. You can download designs into any computer and store them on the jump drive. Then just put the jump drive into the USB port and download them. The Brother PE770 has both a Brother embroidery card slot and a USB port that takes a jump drive. UPDATE: The Brother SE350 has been discontinued and replaced by the Brother SE400. What Is The Difference Between The Brother SE-400 and Brother SE-350? I have a se400 machine and I have had a lot of fun with it. Ive also had some trouble too. I have had in the shop twice because of the tension. It cost 149,00 to have it all overhauled. Now it is in again. What am I doing wrong? It is two yrs old. Kamala, you are an absolute treasure! I’m learning to use the Brother SE-400 I ‘inherited” and love it, but there is a bit of a learning curve. You’ve answered so many of my questions, clearly simply, completely. Thank you! Pe770 to do all sorts of embroidery am not just limited !!! I have been gifted by a Brother CX155LA. But I am scared to do Embroidery on it as I don’t know how. Please show me which tutorials I need to follow.